Armed resistance to occupation has emerged as a major problem in postwar Iraq. It has become a prime concern of the United States, and casts a shadow over its postwar plans for the country. The United States has set very high goals for its mission in Iraq; armed resistance, leading to U.S. casualties and a climate of insecurity, is one variable that could block the ultimate achievement of those goals. While reporting on the resistance is extensive and sometimes insightful, much of the media coverage lacks context and perspective. It provides only names, places, and the immediate circumstances of attacks, or else personalizes the issue by focusing on the potential effects of the deaths of Saddam's sons. Coalition authorities have provided various, and sometimes conflicting, descriptions and explanations for resistance. For example, on July 16, 2003, the commander of U.S. Central Command, Gen. John Abizaid, invoked the concept of guerrilla war to describe resistance in Iraq. Eight days later Secretary of Defense Donald Rumsfeld denied that there was a guerrilla war in Iraq. The Coalition Provisional Authority (CPA), the U.S.-administered temporary government of Iraq headed by Ambassador L. Paul Bremer III, largely avoids public speculation on the resistance, beyond generally attributing it to regime "dead-enders." But dealing effectively with resistance—a long-term phenomenon—can only come from acquiring a clear understanding of the problem, and by eschewing oversimplified or politically motivated conceptions of the issue. History suggests that controlling resistance will be a difficult and time-consuming task, demanding commitment of significant resources and an effective long-term political, military, economic, and social strategy. Unless the coalition can thwart the armed resistance that it faces now, and may face in the future, the prospects for a stable and democratic Iraq will be dim. This article attempts to go beyond the headlines and press briefings and provide an early perspective on the emergence of resistance in Iraq. The situation in postwar Iraq has been fertile soil for the emergence of resistance. The nutrients include the survival of the regime's forces, the uncertain political future of the Sunnis, flagging reconstruction efforts, the growth and persistence of myths, and the widespread possession of weapons. At the war's end, tens of thousands of the regime's security personnel simply disappeared. They include Baath Party militiamen, special and regular Republican Guard troops, and whole divisions of the Iraqi army. These angry and bitter men, especially those most closely associated with the regime such as Saddam Fedayeen, are an abundant potential source of recruits for resistance. Most of the resistance to date has been attributed to them. More generally, the Sunnis were the big losers in the war. They have been deprived of powers and privileges they have enjoyed for decades. The new governing council, with only five Sunnis, roughly reflects the diversity of Iraq, but it is also a good measure of the decline of Sunni political fortunes. Sunni cooperation in building a new Iraq is likely to be grudging and limited in the best of circumstances for some time. To date, the CPA does not appear to have developed an approach for systematically engaging the Sunnis. Instead, there appears to be a reliance on select individuals, at least some of whom are former Iraqi military, to provide local leadership. The Sunnis, resentful of their disenfranchisement, provide rich compost for resistance, and most resistance actions and operations have taken place in Sunni-populated areas. Infrastructure repair and economic recovery have been slow. Many Iraqis expected that in the immediate aftermath of the war, the United States would lift the country out of its economic stupor. In fact, the coalition was slow off the mark in implementing plans for Iraq's postwar reconstruction, and in any case, Iraqi expectations were extremely high. The result has been a widespread sense of disappointment and frustration. On the political side, false starts and apparent backtracking on promises have marred progress towards Iraqi self-rule. The CPA has shown weakness, making important decisions under pressure—first hiring and then firing Baathists, later giving into the demands of former Iraqi soldiers for pay. Decisions in June to postpone and modify steps toward self-government were interpreted as evidence of the coalition's bad faith. The new Iraqi governing council established on July 12, 2003, has limited powers and has drawn sharp criticism from significant segments of the population, including Shi'ites and Sunnis. Saddam will return. The probability that he is still out there, that he may be leading resistance operations, and that he may return to power all create uncertainty about the future of Iraq. Coalition authorities have gone from attributing little significance to him to considering him a major factor behind resistance. "God liberated us, not Mr. Bush." This myth is widespread in the Islamist community in Iraq, both Sunni and Shi'ite. It represents in part a refusal to accept the basic fact that the coalition delivered the Iraqi people from Saddam. Those who believe this maintain that they owe the coalition neither gratitude nor obedience and that the occupation authority is just another imposed regime. Americans covet our women. There are widespread rumors and beliefs revolving around sexual themes. The first of these is the belief that the night vision goggles employed by coalition troops can see through the clothes of Iraqi women. A variation of this was the rumor that coalition helicopters were flying low over Iraqi houses to observe women sleeping on the roofs. At least part of the story around the violent attack on British soldiers in Majar al-Kabir, in which six soldiers died, was the rumor that they were handling the underclothing of Iraqi women. And there have already been threats against women engaging in "horizontal collaboration." While some of this may seem silly to Westerners, it reflects both cultural concerns and the sensitivity of Iraqis to the dominance of the coalition and their vulnerability to its actions. A fourth myth, surrounding the "heroic" deaths of Uday and Qusay Hussein, may well be in the making. Furthermore, Iraq already has a myth of national resistance based on opposition to the British occupation and the 1920 revolt. Iraq is also awash in weapons of the types that are most useful in a resistance situation: light to heavy automatic weapons, hand grenades and rocket-propelled grenades (RPGs), mines, military-class explosives, and mortars. These weapons are effective for engaging most coalition units and are mobile and easy to hide. Saddam's numerous paramilitary and militia forces trained primarily in the use of these weapons. Coalition forces continue to seek out illegal arms, but these efforts are unlikely to limit drastically the availability of weapons to those who seek them. As one Iraqi put it, "We can hide artillery." Measures to ban weapons from the street, while reducing lawlessness and random violence, leave true resistance operations largely unaffected. To all this must be added the impact of escalating coalition operations. Resistance is occurring from within villages, towns, and cities; the responses of coalition forces deeply affect the civilian population. Immediately after the end of major combat operations, coalition operations were largely limited to defensive actions (security checkpoints, police-type patrols). They were extended to limited-scope offensive actions (searches, raids). Coalition forces then shifted to large-scale intelligence-based offensive operations (e.g. Peninsula Strike, Soda Mountain). As of the end of July, the coalition appears to be employing a "raiding strategy" against resistance leadership targets and supporting structures, making use of extensive human intelligence. These operations, no matter how carefully pinpointed, still involve large-scale detentions, intrusions into homes, and the destruction of property. Civilians who have felt the brunt of occupation make for potential supporters of resistance. What is resistance? How is it different from opposition or dissent, which are also evident in Iraq? Resistance has usefully been defined as "organized attempts to work against the regime with the conscious aim of undermining it or planning for the moment of its demise." Opposition and dissent are broader concepts that can include anything from armed resistance to solitary disgruntlement. The essence of resistance is action, and for the purposes of this article, the action is armed and violent. Because there was no formal end to the war (no surrender, no treaty), it is difficult to say precisely when conventional combat by the forces of the regime ended and resistance began. When major coalition operations ended April 14, 2003, Iraq was in a chaotic security situation. The grip of the regime was broken, its forces destroyed, dispersed, or vanished. But the coalition's forces had not asserted control. Coalition units were relatively thin on the ground, particularly in Baghdad and western Iraq, areas that would become important in the emergence of resistance. The coalition's inability to provide a stable security situation throughout the country helped to create an environment in which resistance elements could organize and act. It is still unclear whether or not the regime planned for resistance and sabotage activities in advance of its defeat. Several reports have surfaced indicating that there was some preparation, and the rapid onset of resistance following the end of major combat operations suggests that there may have been some pre-planning. In addition, the regime's wartime strategy of employing small elements of Saddam Fedayeen, Baath Party militia, and other paramilitary forces would have served as a basis for an easy transition to resistance operations. But even without any serious preparation, localized resistance, at least in Sunni areas, was predictable. These areas had been traumatized by the defeat of the regime. They absorbed large numbers of regime supporters with military skills, weaponry, and financial resources. It would have been remarkable if resistance had not developed. And indeed, resistance emerged relatively swiftly after April 14. Between April 21 and April 27, there were ten reported incidents that can be classified as armed resistance. Most of these were small-scale, but one of the attacks, in the Mosul area, involved 20-30 Iraqi paramilitaries. Between April 28 and May 4, the second week of resistance activity, reported incidents jumped sharply to 27. The incidents in the first two weeks already showed evolution. By the end of the second week, RPGs were being employed, and convoys had been targeted. Although the actions remained small, more towns became the sites of incidents. There have been no dramatic changes in resistance from its beginning in the second half of April until the end of July. Rather the story has been one of evolution and adaptation. Resistance expanded geographically. Tactical adaptation and innovation were evident, and over time attacks have inflicted more casualties on coalition forces. The rate of change has been rapid, with new locations of incidents and new types of attacks being added on a weekly basis. Data derived from U.S. Central Command and press reporting indicate that between April 14 and August 3, 2003, there were at least 202 serious incidents of armed resistance across Iraq. (Many incidents go unreported, but those involving coalition casualties are given coverage.) Most of these were in Baghdad or the surrounding area, and most were in Sunni-dominated areas of the country. 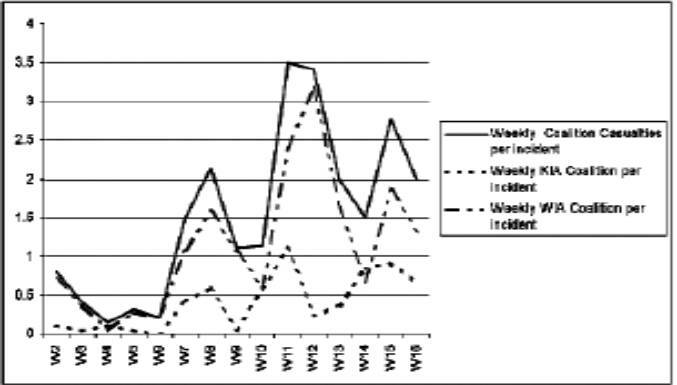 Table 1 shows the number of reported incidents by location per week. The data also show that the number of reported incidents per week was higher earlier in the period than later. While the number of reported incidents per week declined after the first few weeks, the casualties inflicted on coalition forces per reported incident increased. Table 2 shows the coalition killed and wounded in action (KIA, WIA) per week per resistance incident. The Baghdad (25 KIA; 7 WIA), Mosul (6 KIA; 15 WIA), Ba'quba (5 KIA; 7 WIA), and Falluja (4 KIA; 18 WIA) areas have been the most dangerous locations. Resistance actions have become more dangerous to coalition forces as resistance tactics have become more diversified over time. This probably reflects the accumulation of experience by resistance elements, changes in coalition operations, and a decline in the deterrent profile of coalition forces. From relatively few types of attacks in the first several weeks, resisters progressed to more numerous attack techniques. Table 3 indicates the broadening range in types of attacks by resistance elements. Attacks by fire (ABF) or shooting incidents were the most common type of action. In incidents where the types of weapons were reported (see Table 4), RPGs and light to heavy automatic weapons (assault rifles, machine guns) were employed most often. RPGs were involved in at least 39 incidents, making this antitank weapon the weapon of choice. Tactics have included both RPG-sniping (a single shot with an RPG) and RPG-strafing (firing from vehicles). RPGs are highly effective against light armored vehicles and soft vehicles such as trucks and the ubiquitous HUMVEEs. Resistance elements have also engaged in a type of targeted-killing action in which one or two Iraqis approach individual coalition troops at guard posts or check points and shoot them. At least 5 attacks of this kind have taken place in Baghdad and 1 in Qa'im. In Baghdad, there may be at least one resistance element that has specialized in these kinds of attacks. A developing trend has been the use of explosive devices in attacks. There were 24 such attacks reported, most of them occurring in July. Other types of resistance actions include sabotage operations against key infrastructure targets (oil and economic), and attacks against Iraqi persons and facilities identified with coalition efforts. For example, the mayor of Haditha was assassinated along with his son on July 16, 2003, and there have been two reported cases of surface-to-air missiles fired at coalition aircraft. Generally speaking, resistance elements have chosen not to engage coalition forces conducting major sweeps (e.g., Peninsula Strike, Desert Scorpion, Sidewinder, Soda Mountain, and Ivy Serpent), probably preferring to avoid encounters where they do not have the initiative, surprise, or local superiority. Table 5 shows the range of targets attacked. Although no trend has developed, there have been several "quality attacks," featuring organization, direction, and maneuver. While accounts are sketchy, quality attacks appear to have taken place at Hawija on May 25, Falluja on June 6, and near Balad on June 13 and July 4. Geographically, resistance is taking place over a very wide area and on varied terrain. It has been encountered in relatively open areas in western Iraq and near the Syrian border, in agricultural and riverine zones, in villages and towns, and in major urban areas including Baghdad and Mosul. But most resistance incidents have occurred in or near built-up areas, probably because these afford resisters concealment, cover, and a civilian population into which to fade. Urban environments are difficult to penetrate; they provide both the anonymity of the large city and the closed atmosphere of a neighborhood. Table 1, last column, shows the geographic distribution of incidents. Iraq's road system is also an arena of confrontation. There have been multiple incidents at checkpoints and roadblocks, including attempts to crash through them. Although there is only anecdotal evidence, some resistance elements appear to use the roads to move from place to place. Given the known ability of the coalition to intercept and track telephone conversations, it would be logical for resistance elements to use couriers operating on the road system for command and control purposes. The road system can also function as a vector for spreading resistance. People, weapons, money, and probably ideas are all moving over this network, and some of this is likely associated with resistance. Classifying resistance is not a simple task. Even the expression "the resistance" suggests some sort of overarching, centrally directed organization and structure. There is no evidence that such a structure was in place during the first three months of resistance. But the level of organization is something that should be monitored closely since the higher the level of organization, the more capability and operational flexibility a given group is likely to have. Conceptually, resistance to the occupation can occur at four levels: individual, local, regional, and national. The lone gunman exemplifies individual resistance. This is the Iraqi who takes up arms on an individual basis for his or her own reasons and strikes out at the occupation. To date, 26 attacks by individuals have been reported. A combination of weapons has been employed, including assault rifles, machine guns, and RPGs. Most resistance appears to be at the local level by small groups of resisters (perhaps 2-10). Paul Bremer said as much in a statement of July 20, 2003: "What we're seeing is highly professional but very small, sort of squad-level attacks, five or six people at a time attacking us." "Local" does not imply ineffective; even small groups can be highly effective. Anecdotal evidence indicates that these resisters, once engaged, quickly disappear into the local community; coalition use of local informers makes resistance based on outsiders dangerous. Regional resistance would be the third level. Here there is only limited evidence, essentially involving Hizb al-'Awda (Party of the Return), which is said to be operating in multiple locales in Sunni areas. Limited reporting puts cells from this group in Baghdad, Basra, and Mosul and indicates it operates in Tikrit and Falluja. None of this can be confirmed, and coalition authorities have tended to dismiss the existence of resistance at this level. There is no evidence of any national-level resistance movement, one that cuts broadly across Iraqi society This is hardly surprising given the major fault lines in Iraqi society (Kurds, Sunnis, Shi'ites). Nevertheless, it is possible that at least Sunni resistance was organized at the national level before the regime's defeat and is now conducted on a decentralized basis. How many Iraqis are involved in resistance? Estimating the number of active resisters—those who actually engage in attacks—is not easy. One estimate attributed to the Pentagon suggested several thousand. Another estimate by senior U.S. military officials suggested 4 to 5 thousand. And still another referred to the "gang of 9,000." The coalition has estimated that each resistance element contains 5-10 persons, with some as large as 50. If one estimates the size of the average resistance element as 10 and attributes a resistance element to each of the 34 localities and 10 Baghdad districts where incidents have been reported, that would yield a minimum number of 440 active resisters. Very likely there is an even larger number of individuals who support resistance elements by providing shelter, and other services. Coalition authorities attribute the great majority of resistance operations to "regime dead-enders." These potentially include tens of thousands of members of the Saddam Fedayeen, Special Republican Guard, Republican Guard, security service, and Baath party officials. It is indeed likely that these elements are providing the core of resistance. Whether any of them answer to Saddam is unknown, although some resistance elements have attempted to project the idea that he is alive and in command. The periodic messages attributed to him and rumors about his activities probably help to keep up Baathist morale and may aid in the recruitment of former regime associates. But this does not exhaust the recruitment pool for resistance. Local Iraqis in villages and towns, angered by coalition operations (raids, searches, destruction of property, killing and wounding relatives, etc.) make for potential resisters. Local Iraqis are also almost certainly providing assistance to active resistance elements, at a minimum by helping to conceal them from the coalition. The resistance of some locals is apparently religiously motivated. Several mosques have already emerged as centers of anti-coalition preaching and activities (e.g., the Abu Hanifa and Umm al-Qura mosques in Baghdad). Mosques enjoy a large measure of protection from coalition operations because of their religious status, and they are logical locations for resistance activity, especially Islamist-based resistance. The July 1, 2003 explosion next to the Hasan mosque in Falluja, which may have involved a bomb-making class and killed the anti-coalition imam, is indicative of this. Tribesmen are also likely active in resistance, falling into a local category, but the tribes themselves do not appear to be resisting in a structured way. Various types of outsiders make up another component of the recruiting pool. These are individuals who have entered Iraq to fight against the coalition for a variety of reasons. Some are apparently wartime volunteers who have remained. Others are said to be terrorists seeking opportunities to strike at the United States. Still others are mercenaries attracted by the payment of bounties for killing Americans. These outsiders probably number in the tens rather than the hundreds since large groups of outsiders would not be able to blend into the Iraqi population and could be readily identified by coalition informers. Why do they resist? In the very early stages, during the first two weeks or so after April 14, resistance is likely to have been primarily driven by isolated elements of the regime, and perhaps by the spontaneous hostile actions of individuals. After that, motivation probably became more complex: the regrouping of regime loyalists; the recognition by the Sunnis of their position as political losers; the emergence of Sunni religious-based resistance (the "Wahhabi factor"); a response to occupation actions seen as insensitive, provocative, or careless; monetary reward (the reported payment of bounties for killing Americans); and virulent anti-Americanism, inculcated over decades. Finally, some individuals are probably coerced by elements associated with the regime into either active resistance or providing support for it. Beyond the desire to be rid of the occupation, some attacks may reflect a wish among their perpetrators to restore Iraqi honor. One regime-associated resistance element has proclaimed, "This is the time for you to prove to your people that you are men and for you to give your blood cheaply and wipe away your mark of shame." The Iraqi forces lost virtually all the battles of the war, suffering disproportionate losses with no gain. They are not losing all the resistance actions. In some cases they are inflicting casualties without taking any, and in others, they are trading casualties with the coalition and then getting away. As of the end of July 2003, resistance elements were inflicting two casualties per reported incident on coalition forces. Such relatively successful actions restore pride and build confidence. Given the range of likely motives, simple one-cause explanations for resistance—e.g., "regime dead-enders"—are now questionable, and they will become increasingly so with the passage of time. New resistance groups announce their existence almost weekly. By the end of July, nineteen or more groups had identified themselves. A number of their claims may be no more than disinformation intended to confuse coalition intelligence. Some of these groups may be little more than local gangs, and there may be some duplication. Claims of operational successes for any one group appear wildly exaggerated. At the present moment, only Hizb al-'Awda has pretensions of being a credible resistance group. This discussion so far has centered on resistance from within Sunni areas. Table 6 shows the incidents that have occurred in primarily Shi'ite areas, including districts of Baghdad. There have been many fewer attacks associated with Shi'ite areas, and they are more isolated in time. As major political beneficiaries of the war, the Shi'ites had little reason to move early in the occupation to oppose the CPA. Their response so far has been one of watchful waiting, cooperating on some issues and withholding cooperation on others, while preparing for future political battles, both at the local level and within the Shi'ite community. Shi'ite politics are overwhelmingly religious in nature and led by clerics; no significant secular Shi'ite movement has emerged. There are three Shi'ite movements or factions that have resistance potential: the Jama'at as-Sadr ath-Thani, or Sadr group; the Supreme Council for the Islamic Revolution in Iraq (SCIRI); and the Da'wa party. All three of these organizations are highly articulated, possess recognized leadership, and are actively competing for power within the Shi'ite community itself and on the national political stage. The Sadr group is vehemently anti-occupation and has been very successful at gaining influence at the local level. Its leader, Muqtada as-Sadr, has denounced the Iraqi governing council, and called for the creation of an "Islamic army" answerable to Iraqi religious leaders. The Sadr group was not given a place in the governing council. SCIRI has aligned itself, at least to some degree, with one of the Sadr faction's powerful rivals, Grand Ayatollah 'Ali Sistani, but has its own conspiratorial history and a background of Iran-supported armed resistance to Saddam's government. SCIRI was given a seat in the governing council. The third Shi'ite organization, the Da'wa party, also has a long history of underground resistance to Saddam. It, too, was given a place in the council. Overall, the Shi'ites are probably a greater potential danger to the coalition and any transitional government than the Sunnis. Many of the Shi'ites already have the experience of professional resisters. If their political needs are not met, at least some Shi'ite elements are likely to move to resistance. If so, they would pose a major threat. Resistance has taken a toll from both the coalition and Iraqi society. Most obvious has been the toll in terms of casualties. Table 7 shows the casualties reported for both sides from the beginning of resistance to the end of July 2003. This is actually a low rate of attrition, with an average of 18 coalition troops killed or wounded per week in resistance incidents from a force of some 145,000 troops. Reporting on Iraqi casualties is fragmentary, and reports from coalition forces suggest significantly higher Iraqi casualties. The publicity given to coalition casualties magnifies their importance. Every incident receives intense and repetitious media coverage. Resistance sabotage actions have been directed against economic and infrastructure targets, including the oil industry, electric power transmission, and financial targets. The impression is that these have had some effect on the oil industry, although there is no overall data on the economic effects of sabotage operations. Finally, resistance delayed the redeployment home of the Third Infantry Division. The decision to retain this division in country was an explicit recognition of the security problems raised by resistance. Resistance has driven up the human and material cost of occupation and reconstruction. So far this cost has not been prohibitive, but if the resistance adapts and escalates, so, too, will its impact on U.S. decision-making. The long-term prospects of resistance in Iraq are uncertain, but there are already some immediate realities that the coalition must face. Any ideas about a benign occupation and period of quiet reconstruction have been laid to rest. Even though the regime and the Sunnis lost the war, they are still in the struggle. Whether Saddam is alive or dead, elements of his regime are fighting against the occupation, and they are doing this with the support of at least some of the Sunni population. Resistance by forces of the former regime could not continue unless it had that support. Moreover, resistance is not confined to regime "dead-enders." There are Islamists, terrorists, mercenaries, and outsiders involved. These categories probably do not exhaust the persons and groups with a hand in resistance. The resistance wins simply by surviving and staying active. Coalition operations, including the large-scale intelligence-based operations like Peninsula Strike, Desert Scorpion, Sidewinder, and Soda Mountain, will have temporary disruptive effects on resistance, but they will not end it. Resistance incidents recur after operations are concluded or move on. The coalition's shift to an intelligence-based raiding strategy, targeting the leadership of resistance elements, may prove more effective. But an unintended consequence of these operations may be to weed out the less capable resisters while providing the more capable ones with valuable experience in evading and adapting to coalition actions. The emergence of resistance that combines, even if only tacitly, Sunnis and Shi'ites would be a very dangerous situation. This would have the makings of a true national revolt, perhaps something like that of 1920, and it would be difficult to control without significantly greater resources. For the longer term, and assuming the CPA is able to create a legitimate Iraqi government, the danger is that elements of Sunni, and perhaps eventually Shi'ite, resistance groups will carry over into the transition and beyond. Armed, violent, and conspiratorial groups are a challenge for any political system, especially a nascent one. To some extent the coalition's use of informers and collaborators to support its goals is preparing the ground for internecine violence. Already resisters are attacking collaborators and eliminating informers. This kind of internal war is likely to carry over into a transition government and beyond. During July 2003, coalition officials veered from describing the resistance as "regime dead-enders" to citing a m?lange of Baathists, Islamists, terrorists, and mercenaries—all without central direction. This is a step forward, but these same officials have not provided a credible model of resistance organization and operations. That would require facing up to the contradiction between the positive declared mission of "Iraqi freedom" and the negative missions inherent in occupation. The coalition's inability, or unwillingness, to fully characterize what it is up against suggests that it has not achieved the understanding necessary to defeat the resistance. The situation demands a realistic appreciation from the coalition and its supporters for the potential of violent opposition, both for the short and the long terms. Noble motives and millennial objectives will not spare the coalition a confrontation with an unpleasant and messy reality. Jeffrey B. White is an associate of The Washington Institute for Near East Policy, which he joined after a thirty-four-year career in the Defense Intelligence Agency (DIA). He is a specialist in military and security affairs of Iraq and the Levant. Michael Schmidmayr studies the Middle East at the Institut d'Etudes Politiques de Paris ("Sciences Po"). Associated Press, July 24, 2003. This is based on analysis of various mentions of former Iraqi military officers appointed to key positions such as mayors. Associated Press, June 3, 2003. Agence France-Presse, July 18, 2003. The New York Times, June 22, 2003. Associated Press, June 29, 2003. "God Liberated Us, Not Mr. Bush," The Economist, May 31, 2003. Agence France-Presse, May 17, 2003. Judith Yaphe, "The Challenge of Nation Building in Iraq," in U.S. Policy in Post-Saddam Iraq: Lessons from the British Experience, Michael Eisenstadt and Eric Mathewson, eds. (Washington, D.C.: The Washington Institute for Near East Policy, 2003), p. 46. The Christian Science Monitor, May 22, 2003. The Washington Post, May 30, 2003. Associated Press, July 13, 2003. The Washington Post, July 28, 2003. Ian Kershaw, Popular Opinion and Political Dissent in the Third Reich, new ed. (New York: Oxford University Press, 2002), p. 3. Ian Kershaw, The Nazi Dictatorship: Problems and Perspectives of Interpretation, 4th ed. (New York: Oxford University Press, 2000), p. 207. The Washington Times, June 9, 2003. Counts are mainly based on reports from U.S. and British military sources. Serious incidents, those in which coalition forces take casualties, receive coverage. There are other, generally minor incidents without casualties, that go unreported. Neither the above-mentioned military sources nor the press reported any incidents in the first week after the end of major combat. A single anomalous incident in the town of Majar al-Kabir in southern Iraq accounted for the most killed, 6, on any one day. This appears to have been a spontaneous incident and not true resistance. Associated Press, July 20, 2003. Julian Jackson, France: The Dark Years, 1940-1944 (New York: Oxford University Press, 2001), pp. 496-7. There has been one reported case from Falluja of resistance elements from outside moving into a town and conducting operations. Los Angeles Times, July 21, 2003. The Wall Street Journal, July 28, 2003. The Washington Post, July 23, 2003. Agence France-Presse, July 19, 2003. Associated Press, July 18, 2003. Agence France-Presse, June 6, July 18, 2003. Gen. John Abiziad, press briefing, July 16, 2003, Department of Defense transcript, at http://www.defenselink.mil/transcripts/2003/tr20030716-0401.html. Interpress Service, June 16, 2003. The Washington Post, June 29, 2003. The New York Times, July 19, 2003. The Washington Post, June 30, 2003. Associated Press, June 22, 2003. Related Topics: Iraq | Jeffrey B. White | Fall 2003 MEQ receive the latest by email: subscribe to the free mef mailing list This text may be reposted or forwarded so long as it is presented as an integral whole with complete and accurate information provided about its author, date, place of publication, and original URL.